1盎司2017年埃及遗迹系列|图坦卡蒙王金币 Purchase this 1 oz gold coin featuring King Tut at the lowest prices online. Beautifully packaged in a Certi-Lock card complete with serial number. 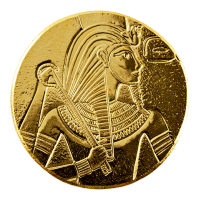 The gold King Tut coin is the third release in the new Egyptian Relics series from the Scottsdale Mint. The series is based on famous hieroglyphics, and is made to look like it was removed straight out of the wall in a pyramid! The blanks are struck without a collar, which allows the gold to be struck in a unique shape for each coin. Each coin comes in a Scottsdale Mint Certi-Lock card that has a serial number as well as the exact number of mintage. Spectacular design and limited mintage will give this coin enduring appeal, order yours while you still can!